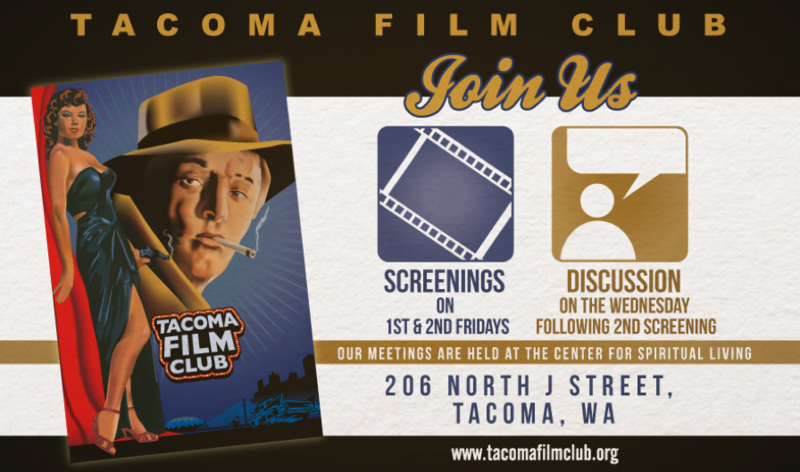 The Tacoma Film Club is an organization in Tacoma, Washington designed to celebrate and promote the appreciation of good films. We hold monthly meetings set up much like a Book Club. Each month we select three films to watch and discuss, typically one theater film and two films on DVD. We hold public screenings of our DVD discussion films the first two Fridays of the month, and then on the following Wednesday we get together to discuss all three films. Highbrows and novices alike are welcome! We announce monthly film selections through the email list. If you want to sign up, please do so using the menu option “Join the Email List”. We use this WordPress web page and blogsite to facilitate announcements of the chosen films, provide club news, and share commentaries about films we have selected for screening and discussion. A listing of our recent posts and comments is provided to the right. Use the drop-down archive menu in the top menu listing to view the list of films and our postings about those films we have discussed over the history of the club. Or choose the “History” menu option for a consolidated list of all TFC film selections over the years.